Concerned about a loved one's hearing loss, or yours? Many of our patients report that they notice - or recognize in loved ones - early signs of hearing loss. Hearing loss is a fact of life for many of us and can be treated in a number of ways. Our audiologists provide complete diagnostic testing for all ages to determine the type and severity of any hearing loss that may be present. Some types of hearing loss are medically correctable and the diagnostic evaluation assists our medical staff in determining the best course of treatment. Loud noise over time is often a cause for hearing loss. We encourage you to use hearing protection when you are in noise and are pleased to provide you with complementary foam ear plugs at your visit to our clinic. We can also fit you with custom hearing protection designed for musicians, hunters, people who want high fidelity but at a softer level. We can even fit you with custom ear plugs for sleeping. Some types of hearing loss are not medically correctable and require amplification. The audiology staff of Dr. Chiquita Ewert and Jon Schee, M.S. are experienced and well qualified to counsel you regarding your hearing loss, help you select, and fit you with technologies to help you hear your best. Lifestyle, communication needs, dexterity, hopes and expectations of hearing aids are taken into account when selecting a product that will best meet your hearing needs. Hearing aid technology has rapidly advanced and there are now smart options that range from completely self-adjusting to user-friendly smartphone app adjustable. Many of the products that we carry can be synched to smartphones for direct streaming so that your hearing aids also act like Bluetooth earpieces. We also carry rechargeable options. Isn't it normal to have some hearing loss as we get older? Hearing loss is common. It is the 3rd most prevalent age-related disability following arthritis and hypertension in adults over 75. Hearing loss is not “normal”. Untreated hearing loss can cause people to avoid social settings, miss out on conversations with others, and become more withdrawn. They may begin to feel left out of family conversations. I know I have trouble hearing. What should I do? Contact our office for a complete evaluation. 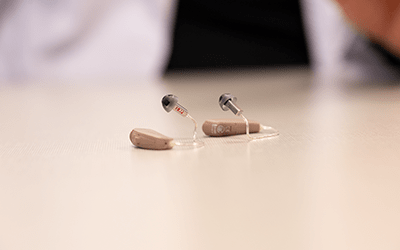 Some types of hearing loss are medically correctible and we want to work with you to achieve your best possible hearing before considering hearing aids. Our audiologists will perform a complete hearing evaluation and discuss your results. Otolaryngologists, or ear, nose and throat specialists who are physicians who specializing in treatment of disorders of the ear will evaluate your ears to determine if medical treatment is necessary. Nurse practitioners are also available to evaluate and prescribe a course of treatment for common medical issues that effect the ears. As a team we will diagnose your hearing loss, discuss your results with you and determine the next steps for treatment. Do you have hearing aids at Ear, Nose, Throat Clinic & Hearing Center of MN? Yes, we carry medical quality hearing instruments from major manufacturers which are available in a variety of styles and technologies. We have options that are rechargeable, can sync to smartphones, utilize smart apps as well as options that are elegantly simple to use. Your lifestyle and communication needs are considered along with your hearing evaluation as we educate you and guide you in the process of selecting hearing aids that are right for you. After your assessment, our audiologists will discuss the best options to improve your hearing. How do I know that it's time to buy a hearing aid? Most of our patients reach a point where their frustration with hearing loss propels them into action. We assist in the process of identifying the loss, learning how it can be treated, and explaining the management options. Recent improvements in technology have enabled millions of people to enjoy better hearing through hearing aids. Our patients who use these devices report great sound quality, an improved ability to follow and understand conversations in social and work situations, an easier time when watching movies, TV or talking on the phone, and often an improved attitude and outlook on life. Many patients report that their hearing aids are so comfortable that they forget they are wearing them. There are fewer stigmas regarding hearing aids. Others may forget you have a hearing loss as you will not ask people to repeat themselves as often. The hearing aids available today are better suited to treat hearing loss than ever before. Digital technology has enabled the development smart hearing aids that can be effectively customized to better meet your individual hearing needs in a variety different sound environments. Will it be hard to adapt to wearing a hearing aid? An adjustment period is typical for many of our patients as your brain adapts to hearing many sounds again. It may take some time to adjust to the new high or low frequencies that are added to their hearing range. The audiologists follow up with new hearing aid users regularly to insure that they are successful and hearing their best. We welcome return visits from our patients to assess progress, monitor changes or answer questions. Hearing aids are finely-tuned devices that have a profound effect on users. Many of our patients report hearing sounds they never heard before. Can I keep my hearing from getting worse? Perhaps. Hearing loss is often preventable. For that reason we encourage all of our patients to wear protective plugs when they are exposed to loud noises. (We define any noise that causes you to need to raise your voice in conversation as a “loud noise”.) We are pleased to offer free foam earplugs to all our patients. If you will need to use them frequently, you can ask us to fit you for a pair of custom or specialty ear plugs, such as musicians’ plugs, which provide ear protection, yet allow music to be heard. Don't Miss Out on Life Around You!